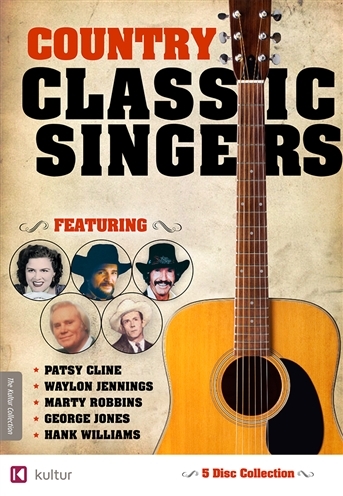 Grammy Award-winning Country Music Hall of Fame inductee Marty Robbins offers a definitive portrait of his remarkable musical legacy in this release featuring highlights spanning three decades and an astonishing ninety-four albums. In addition to offering nineteen classic hits including “El Paso”, "I Walk Alone," "Maybelline," "Devil Woman" and "Tonight Carmen," Robbins also takes the stage for live performances of such classic country ballads as "Mr. Shorty," "Faleena," and "Big Iron." Country legend Patsy Cline's tragically shortened life and career are examined in footage from ten different television shows. Interviews with George Jones, k.d. lang, and Willie Nelson (who wrote her signature hit "Crazy"), as well as the woman herself performing over 15 songs, makes this an excellent disc for any country music enthusiast. Waylon: Renegade. Outlaw. Legend. is a memorable portrait of one of the great legends of country music, featuring a full Grand Ole Opry concert as well as over 20 classic clips of Waylon’s greatest hits; with guest appearances by Johnny Cash, Chet Atkins, George Jones, Willie Nelson, Jessi Colter and many more. In the Hank Williams Tradition combines a concise biography of Hank Williams Sr. with reminiscences by Nashville greats Roy Acuff, Chet Atkins and Minnie Pearl; with performances of Williams's classics by some of country's finest contemporary artists, including Randy Travis, EmmyLou Harris, Ricky Skaggs, Dwight Yoakam, Waylon Jennings and others.